As they don't obviously possess feet or paws as most insects and animals do, it may seem hard to understand exactly how a slug moves. First, you must understand the autonomy of the slug and how they live. Slugs are basically snails without the shell, and are sensitive slimy creatures. Their face features four tentacles: two to sense light and the other to sense food. A tail makes up most of their body, with a mantle near the head and a small nostril to the side. The "foot" of a slug encompasses the entire bottom of its body. When you examine one up close, you can see the "grips" in its skin. The foot of the slug pulls the animal from front to back as it glides along areas of land. The slug is very flexible, so it can move in multiple locations, usually looking for plants to eat or places to hide. 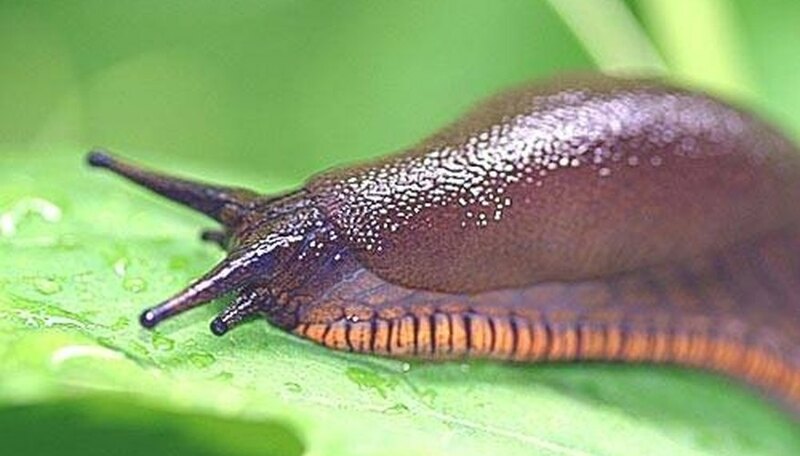 Slugs must always be moist, or they can die from desiccation. Desiccation occurs when something gets extremely dry and starts to shrivel and crack. When slugs move around, they must protect their body and avoid dryness by always producing slime. This is how slugs make a trail when they move. Slugs travel over many surfaces, including rock, dirt and wood, but they prefer to stay and travel in moist places for their protection. The slime and mucus produced by the slugs help them move up vertical areas and keep their balance. Slug movement is slow and gradual as they work their muscles in various areas and constantly produce mucus. When mating, slugs move and contort their bodies to wrap around their mates. Their lack of a bone structure allows slugs to move in this fashion, and they may even use mucus to hang from a leaf or grass in order to mate. Donahue, Alan. "How Does a Slug Move?" Sciencing, https://sciencing.com/a-slug-move-4741406.html. 24 April 2017.